churumuri.com is pleased to associate with India’s first web-based photo syndication agency, Karnataka Photo News (KPN), for the inaugural T.S. Satyan Memorial Awards in Photojournalism, in honour of the legendary photojournalist—a well-wisher of both churumuri and KPN—who passed away two Decembers ago. 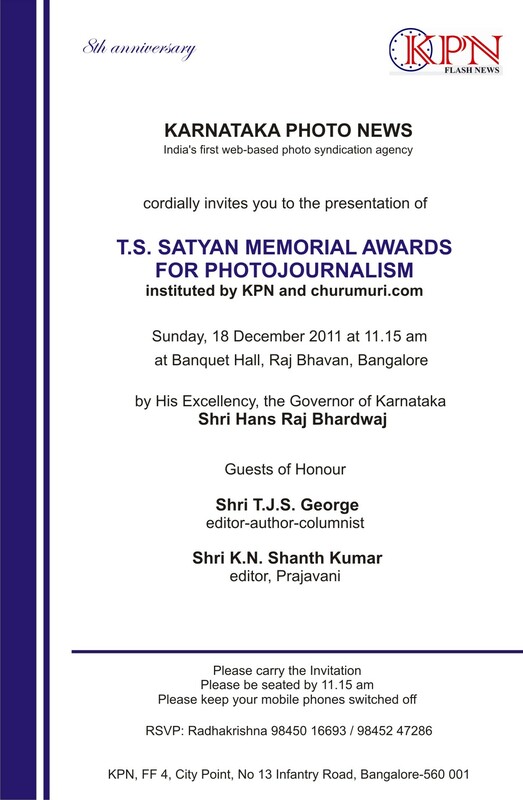 The awards in six categories (lifetime achievement, and best newspaper, magazine, online, freelance and young photojournalist) will be given away by the governor of Karnataka, H.R. Bharadwaj, on 18 December, Mr Satyan’s birthday, at the banquet hall in Raj Bhavan. The veteran editor, author and columnist T.J.S. George, and K.N. Shanth Kumar, the editor of Praja Vani, will be the guests of honour. Shanth Kumar, who holds the unique distinction of having covered six Olympic Games as a photographer, will deliver the keynote address. Nominations for the awards came from the Karnataka media academy, press club of Bangalore, Karnataka union for working journalists and the photojournalists association of Bangalore. * Entry for the function is by invitation only. A few invitation cards are available on a first-come-first-served basis from the offices of KPN on Infantry Road in Bangalore. Contact Saggere Radhakrishna on 98450-16693 and 98452-47286. This entry was posted in Kannada & Karnataka, Media, Mysore-Bangalore and tagged Churumuri, Infantry Road, K.N. Shanth Kumar, Karnataka Media Academy, Karnataka Photo News, KPN, KUWJ, Olympic Games, Photojournalists Association of Bangalore, Press Club of Bangalore, Saggere Radhakrishna, Saggere Ramaswamy, Sans Serif, T.J.S. George, T.S. Satyan. Bookmark the permalink. Congratulations to Team Saggere for instituting TS Satyan award. Wishing function a big success . Dear (Gouri Satya) Sir, thanks for your wishes and blessings.